Observe teams as they operate their devices. Review teams’ engineering journals, examine devices, and talk to team members to understand their design process, from brainstorming through to testing and final preparations for the event. Must attend a 75-minute training session. Judge training occurs on the same days as test trials, so you can stay and see test rig operations. Judges are strongly encouraged to volunteer for more than one shift. Engineering experience is not required. You cannot be a judge and a team adviser the same year. You cannot be a judge if you have a child participating in the Tech Challenge. Judges must be at least 18 years old and have graduated high school. Team check-in: Be the first to greet our teams at the showcase. Help us track who shows up, and help the teams head off in the right direction. Judging support: Collect scoresheets and return them to head judges. Judges must attend a training session to learn about the challenge, see the test rig and learn how to evaluate teams. Training sessions are scheduled on the same days as test trials, so you can stay to see the rig operations. Support you and/or your group every step of the way. Provide all necessary training appropriate to each volunteer's position. Provide recruiting information and materials. Recruit volunteers for the showcase. 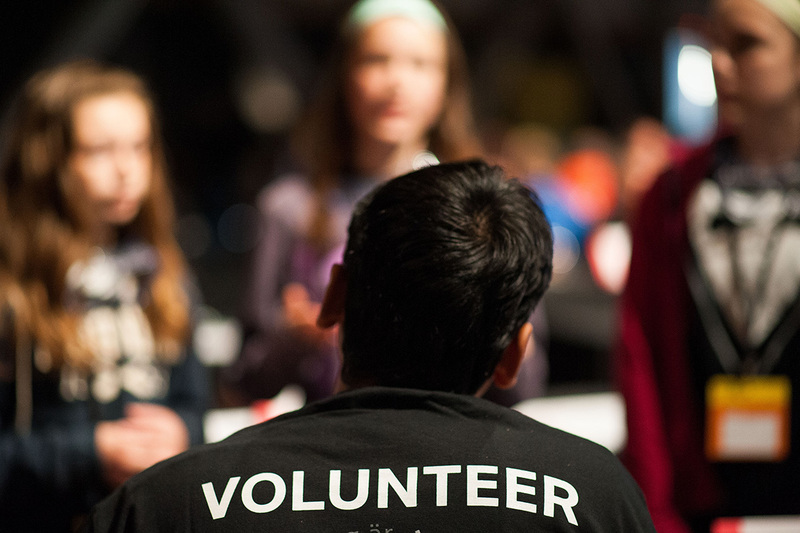 Ensure that each volunteer registers for a position through our website. Participate in a rewarding and inspiring event where you get to see our future innovators in action! First-year volunteer: Sushma is an engineer who works with Tellabs. She served as a judge at The Tech Challenge and was impressed that the kids came prepared with extensive logs on how they developed and built their solutions. She said the students used creativity in everything they did, from their approach to solving the challenge to naming their teams. Sushma says she volunteered to judge this competition to connect with future engineers, and she had a fantastic time. Long-term volunteer, judge: Kevin is a retired Lockheed Martin engineer who has been volunteering with The Tech Challenge since 2007. He started out as a judge and had such a great time that he became a head judge, helping to design the challenge, develop rules and guidelines, and conduct training for advisers and teams. Prior to becoming a judge, he served as an adviser when his middle-school daughter competed. Kevin encourages people to get involved because of the contagious enthusiasm of the students and the fact that everyone participating — from judges to traffic controllers — has a blast. Long-term volunteer, adviser: Camille is a project manager at Northrop Grumman who has been volunteering with The Tech Challenge since 2008. That first year, she worked with an all-girls team as adviser, providing technical advice and inspiring young women to seek careers in engineering. Now a head judge, Camille says that despite coming in with undefined expectations about the experience, she has found it very rewarding, and most important, fun!